I’ve been slacking, I know. This past week has gone by in a blur – an unexpected opportunity, some business that warranted my full attention, some family obligations; it was quite a week. But really, these are all excuses. The real reason I’ve been slacking off is because it’s the Victoria Day weekend. Victoria Day or, as it's more popularly known, May 24 (pronounced two-four), is a seasonal rite for most Canadians. This statutory holiday (celebrated in various degrees/forms across our nation) has grown since its inception to signify not only the birth of a queen, but also the unofficial start to summer. As I’ve mentioned before, I’m not too fond of being cold — and our spring has been just that. Sure, we had days that flirted with the concept of spring; flowers bloomed, skies were blue, sun was shining, but few days were definitively spring-like. Most days were cold, grey and gloomy, bringing about thoughts of turtlenecks and fireplaces, rather than flip flops and daffodils. And so, it was with great hope that I welcomed this year’s May 24 weekend. Come Friday evening, the exodus to cottages, cabins and campsites began. The city’s population deflated exponentially. Traffic is part of the ritual, grocery stores crowded with people packing coolers is usual, fireworks stands at the side of the road are integral to the landscape of the weekend. Time for brains to check out, and relaxation to check in; plant yourself firmly onto a deckchair, and don't plan on moving until the long weekend is over. Even though this May 24 was a mix of sun and cloud, warm and cold, I’m still optimistic. The inherent spirit of the holiday, the anticipation of summer, is intoxicating. A promise of warm evenings, the start of patio season, and flower-scented breezes is in my mind. Not to mention the food. Winter weather food is about comfort, fall food is about bounty, and spring food is about freshness, whereas summer food is about mirth. Pared down dishes, but with personality — the fiery heat of chillies, cool citrus, sprightly herbs; menus are full of contrast, texture and brightness. One cannot help but be happy when eating summer food. I made a quintessential May 24 dinner of burgers, but I’m wary to include the recipe. I was casually playing with the idea of a vaguely Mediterranean chicken burger, but it seems I was a tad bit too laid back. I produced under-seasoned results. I’ll fiddle, and post that recipe later. Until then, here is the perfect toast to the season; spicy, tart, and utterly refreshing, this tea begs for long afternoons spent on the porch. In a small saucepan, combine sugar, water, ginger and lime zest, and bring to a boil. Simmer the mixture over moderate heat, until the sugar dissolves. Remove from the heat and steep, about 10 minutes. Strain the mixture. In a large saucepan, bring the water to a boil. Remove from the heat, add the teabags and steep for five minutes. Remove the teabags and let cool to room temperature. Transfer to a pitcher and refrigerate until chilled. 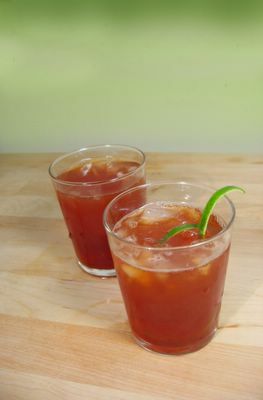 When ready to serve, add zest, lime and cranberry juices and stir in about 1/2 cup of the ginger syrup, or more to taste; refrigerate the remaining syrup for later use. Serve in glasses over ice, garnished with additional lime zest. • You can also use a combination of black tea and Apple Zinger tea from Celestial Seasonings. I do not like to completely omit the black tea, as it adds character and a bit of depth to the drink. • A splash or so of rum makes a welcome addition.